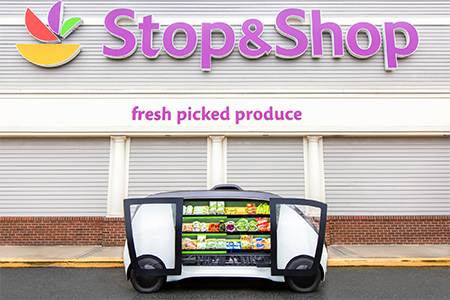 Stop & Shop plans to pilot driverless vehicles that bring consumers a selection of groceries when summoned via an app. The Ahold Delhaize USA supermarket chain said Wednesday that the test, due to launch this spring in greater Boston, will use autonomous electric vehicles from San Francisco-based startup Robomart Inc. Billed as a “self-driving grocery store,” the vehicles will carry an assortment of produce, meal kits and convenience items directly to customers, where they can choose what they want. The process works as follows: Stop & Shop customers use a smartphone app to request a shopping visit from the closest Robomart. When the vehicle arrives, customers go outside, unlock the vehicle’s doors and then pick the fruit, vegetables and other products they want to buy off the shelves inside. After taking their items, they just close the doors and send the vehicle on its way. The vehicles’ RFID and computer vision ”grab-and-go” technology automatically records the products customers selected and charges them. Receipts are e-mailed in seconds. The driverless vehicles are piloted remotely from a Robomart facility. Stop & Shop said store associates will restock the teleoperated vehicles with fresh items throughout their journey to ensure the best selection for customers. Perishables are kept fresh via purpose-built refrigeration and temperature control in the vehicle. “We are still determining pricing and any fees and will share that information at a later date,” a Stop & Shop spokeswoman said. Besides at-your-doorstep convenience, the vehicles offer a checkout-free shopping experience and address a key consumer obstacle in online and mobile grocery shopping: the ability to pick out your own fresh produce, Stop & Shop and Robomart noted. The Quincy, Mass.-based grocer said Robomart also could extend the chain’s market reach beyond its brick-and-mortar footprint. The system, too, provides detailed analytics that offer insight into sales and consumption patterns. The partnership marks the second Stop & Shop robotics pilot announced this week. On Monday, Ahold Delhaize USA unveiled a program to deploy maintenance robots from Jabil’s Badger Technologies at about 500 Giant/Martin's and Stop & Shop locations to help improve in-store efficiencies and safety. And in another test, Ahold Delhaize USA is working with Takeoff Technologies to develop mini robotic warehouses to assemble orders made through online grocery subsidiary Peapod, with pickup available through Stop & Shop stores.